The Department of Forests and Park Services (DoFPS), Ministry of Agriculture and Forests celebrate International Tiger Day in Norbugang gewog, Nganglam Dungkhag under Pemagatshel Dzongkhag. The Global Tiger Center in Gelephu and the Royal Manas National Park on behalf of DoFPS took the lead to celebrate this year ’s international tiger day on 29th July 2018. 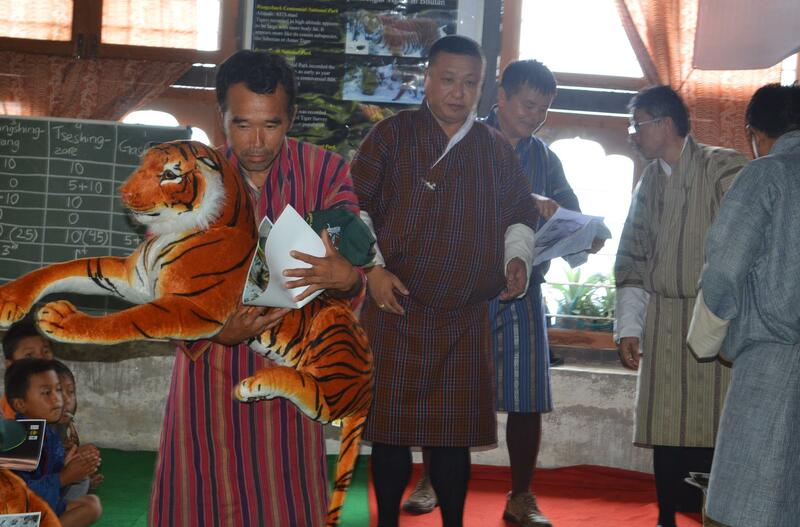 ­According to the program director of the tiger center, Tshering Tempa, the theme of this year’s tiger day celebration is “ Monks and Farmers for Tiger Conservation”. The celebration of the tiger day started from 26th July 2018 with awareness programs to the communities in four chiwogs of Norbugang gewog. In addition to forest officials from tiger center, RMNP, and Nganglam Range, Khempo of Dho Nngag Tenpailing Monastery, principal, health assistant, gewog livestock extension officer, gup, and other officials from Norbugang gewog joined the team to create awareness on tiger conservation and waste management. During the two days awareness program, forestry officials from tiger center, RMNP, NCD, and Nganglam Range gave talks on the status of tigers, the importance of conservation, and measures taken by the government to protect tigers and other wildlife. Khempo spoke about poaching and sacrosanctity of all life forms. These two days awareness program concluded with the final day celebration of international tiger day at the Norbugang Primary School, on 29th July 2018. 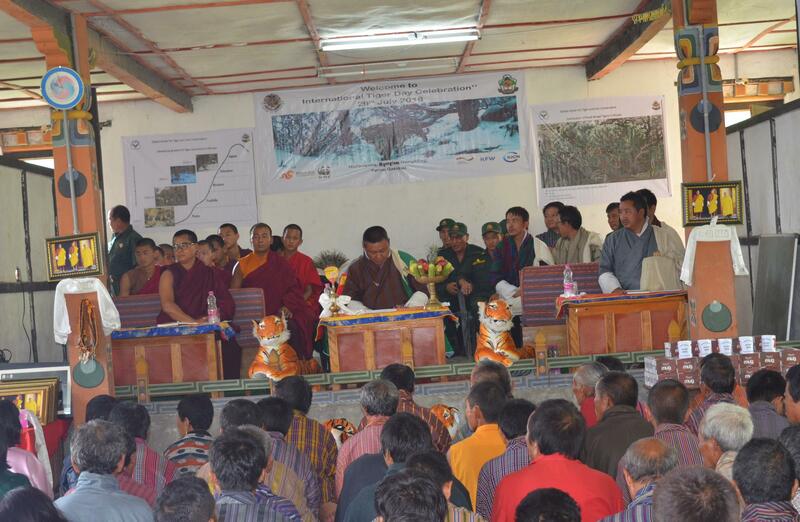 Communities from all chiwogs of Norbugang, forests officials from RMNP, tiger center, Nganglam Range, Pangang Range, gewog officials of Norbugang, Khempos and monks from Dhongag Tenpailing Monastery, gathered for the celebration of the international tiger day. The heavy rain in the morning did not deter more than 500 people to join the celebration. The Drangpon of the Nganglam Dungkhag Court graced the day’s celebration. More than 20 poachers have taken a wow from the Khempo to give up poaching activities. This is very significant, according to Tempa of tiger center. He said, “ This time about 20 of them are giving up, we are looking forward to few more to give up. I am inspired at the sometimes very emotional to witness this vow taking the event. My colleagues Mr. Dorji Wangchuk and Mr. Sonam Wangchuk of RMNP along with Khempo have been very instrumental in convincing these poachers to come forward and give up these kinds of activities”. DoFPS thank and offer our greatest appreciation to other incredible people, particularly khempos, Principal and Health Assistant of Norbugang for taking a very proactive role in curbing poaching activities in these areas. Mr. Tandin of NCD said, “ this is incredible, this is the first time that communities, monks, and local officials joining hand and coming forward to help us to protect tigers and wildlife”. 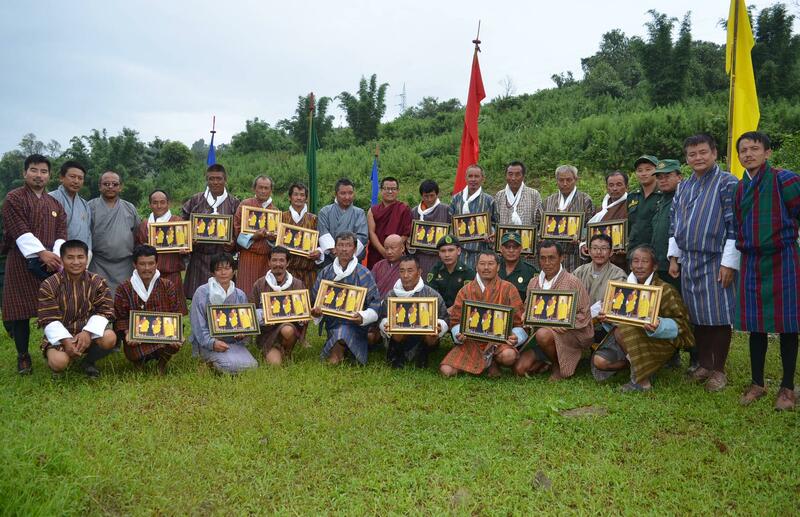 As a token of appreciation, on behalf of DoFPS, these ex-poachers (now) were given white scarves, prayer beads, and portraits of Their Majesties and His Holiness the Je Khenpo. The funding for this year’s program for the international day celebration was provided by Bhutan Foundation, WWF, and IUCN-KWF.